Your eCommerce business is incomplete without an Amazon Seller Account. Selling the products on Amazon and on your own website based on CS-Cart platform & then managing the Sales on separate panels can be a really challenging task. To tackle this challenge, we have developed a perfect solution – Amazon CS-Cart Connector. Now it has become easier to sell on multiple channels & manage catalog and orders on just one platform. With the help of this add-on, you can manage your products and orders of Amazon via CS-Cart backend. You can also export and update the product on Amazon via CS-Cart admin panel just by configuring this simple and effective addon. Take your online business to a new level with the help of CS-Cart Amazon Integration. Import/Export the CS-Cart products to Amazon and vice versa. The product information like the main image, name, price, and quantity get imported along with the product. The admin can add & connect multiple Amazon Accounts to Import/Export from each account separately. Option to export product individually or in bulk is provided. So that admin can export CS-Cart products which are not in his/her Amazon account. Functionality to import Amazon orders to CS-Cart store. The admin can manage & process the imported Amazon orders from CS-Cart. Admin can fetch & sync the orders between the desired date range. Functionality to import the orders of the particular customer via email or order id. Option to update products on Amazon in real-time. Enable/disable the real-time synchronization of imported products’ details on Amazon shop. Enable/disable the real-time synchronization of exported products’ details on Amazon shop. An option to update product Inventory only on Amazon when order placed in CS-Cart. After downloading CS-Cart Amazon Connector add-on you’ll get one zip file, one install.txt file, and a relevant User Guide manual doc. Read it carefully for proper configuration. The add-on will be installed successfully with a notice to get the User Guide manual link. The store owner needs to get Merchant ID, Access Key, and Secret Key from Amazon seller account. Please log in to Amazon Seller Central and go to Settings>User Permissions. Once clicking on this you will arrive on the User Permissions page. 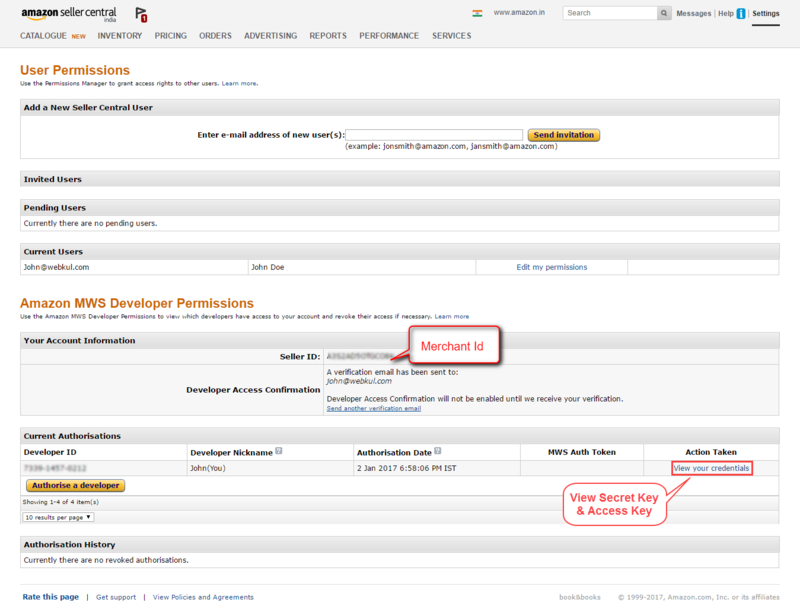 In order to get Amazon Developer Id and Developer keys, a user first has to do registration. After registration, a user can copy the Seller ID. 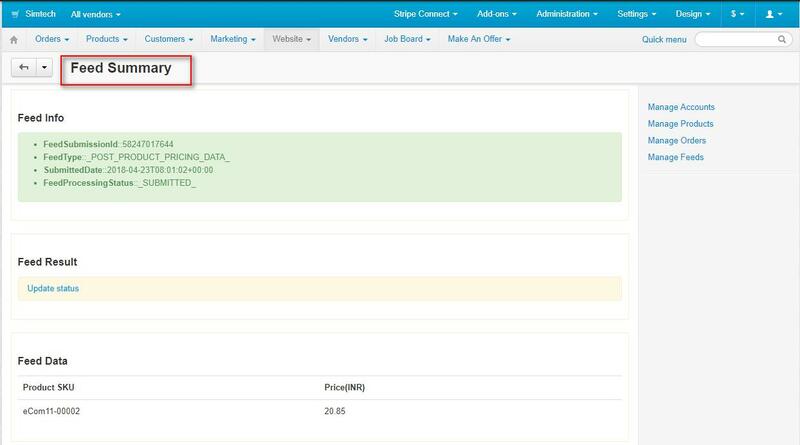 This seller id is actually the merchant id which we require in amazon connector configuration at CS-Cart end. Then, click View your credentials in Action Taken. A small pop-up window will appear. Now, the admin can view Access Key and Secret Key as visible in the screenshot below. Go To Website-> Amazon Connector. Here the admin can manage the products and orders of multiple merchant accounts. Admin can add/edit numerous merchant accounts & manage their products, orders & feeds separately. List of all the merchant accounts will be here in the Manage Accounts tab. Click on + button to add a new merchant account. Default Category to which the Amazon product will be imported. Further, there are some settings for real-time updates of the data. Check the box if you want to update the imported product in real time. Check the box if you want to update the Exported product in real time. If you want to update the product inventory in real time whenever an order is placed then you can check the third checkbox. If you have not checked the fields for Update Imported Product/Update Exported Product. Then it will not work. So even if you have checked this box but have not checked any of the aforementioned, the inventory will not be updated on order placement. 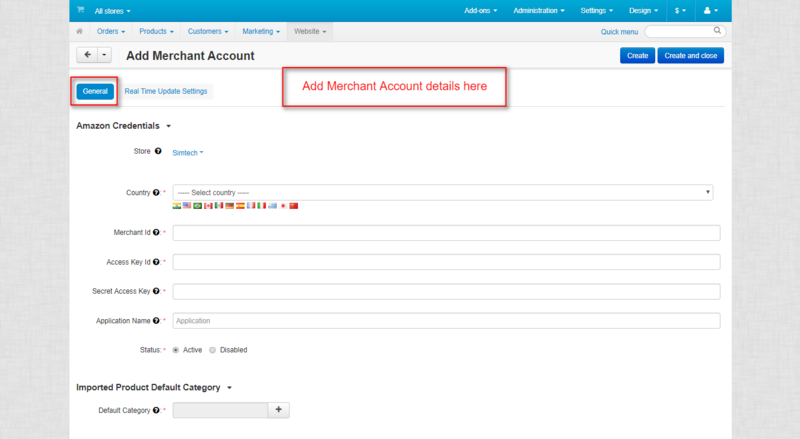 After the account is added, you can establish the connection between CS-Cart and merchant account by clicking the button provided for checking connection as shown below. 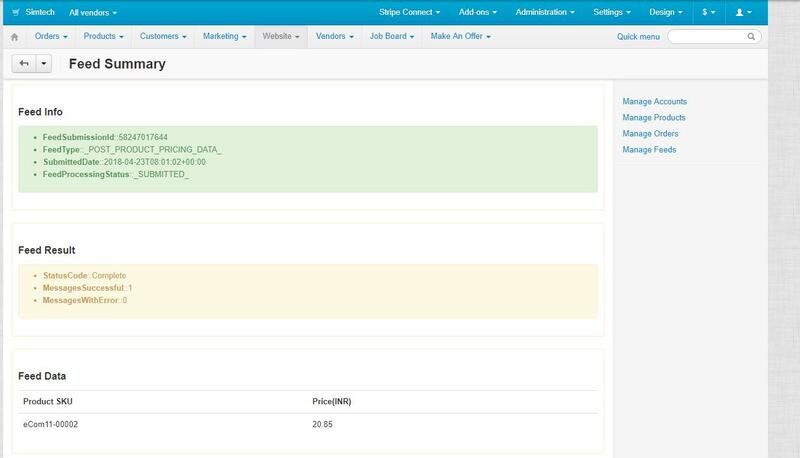 This is how you can add & manage multiple merchant accounts in your CS-Cart backend. How To Import Products From Amazon? Click on Manage Products of the desired merchant account as shown. You can manage all the imported products here. To import the new products from Amazon, Click on Import Products button as shown below. This action will open up a pop-up which will show how actually the Import process works. Just click on the Generate Report Id button as shown below. This is how you can submit the report to Amazon. The product will be imported after a certain time period after the report gets processed. You can update the price/quantity/image of the individual products. The products are synchronized in real time as per the Connector configuration. You can disable/enable real-time synchronization of the individual products from here as well. To update the price of an individual product on Amazon, Enter the desired price and click to update. To update the quantity of an individual product on Amazon, Enter the details & click to update. To update the Images of an individual product on Amazon, Enter the URLs of all the images separately & click to update. Each time you update anything in the product, the feed will be submitted. You can check the feed status under Manage Feeds section as shown below. You can get the current feed status by clicking Update Status. Click the feed-Id or view button to view the feed details/summary. How To Import Order Details From Amazon? Go to Manage Orders section to import the orders as shown below. Click on the + button to import the orders as shown below. Import orders placed within a specific date range. Import individual order by order id. Orders received from any particular customer. Orders via specific payment methods or with specific order status. Just set the desired parameter and click Import Order to import. The imported orders list will then be available on the manage order page as shown in the below screenshot. Just click on the Amazon order id to view & manage the order via CS-Cart. Order details page of amazon order where you can manage the orders accordingly. To create and process shipment, create order shipment as shown below. Just enter the details and click to create the new shipment for this order. This is how you can import and manage Amazon orders via CS-Cart panel. How To Export Products To Amazon? You can export the CS-Cart products to your Amazon store individually as well as in bulk. Go To Products details page at the backend to export individual product. Click on the Amazon Connector tab & set the mandatory fields. Choose desired amazon account you want to export the product to. Select the type of product Id type (ASIN, EAN, UPC) with which you want to export. Enter the corresponding Id & Save. After saving, click on the gear button drop-down & hit the export option provided as shown below. The feed will be submitted to Amazon and it will be exported after a certain period of time once the feed status gets completed. You can check the feed details under manage feeds section. To export/update the products in bulk, just open the product list page, select the products and click to export as shown below. Just enter the parameters corresponding to each product and Export as shown below. This is how you can export the products from CS-Cart to Amazon.